Using no-chemical cleaning systems means no cleaning chemicals must be packaged in containers or boxes. Cleaning solutions are transported every day throughout the U.S., which costs money, requires fuel, and releases greenhouse gases. Some no-chemical cleaning systems are compact enough to be installed directly to water fixtures in a facility, essentially eliminating storage requirements. 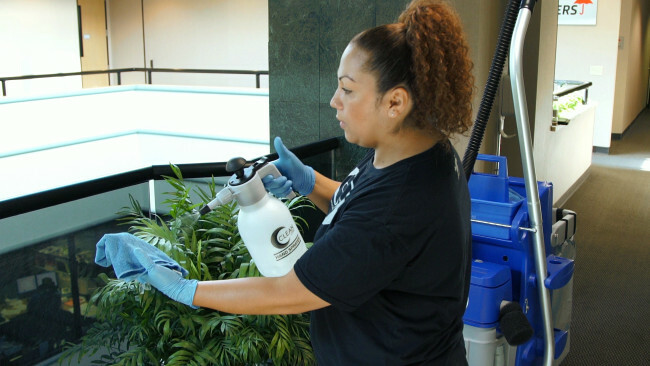 CleanCore cleaning systems are designed to be used on an “on-site/on demand/where needed” basis. Aqueous ozone systems’ SDS (MSDS) indicates there are essentially no hazards when using these systems. No gloves, goggles, or protective gear is required. The cleaning water can be disposed of by pouring down the drain. Because no chemicals are involved, there is no mixing or diluting of chemicals. Many cleaning worker injuries occur when they are mixing/diluting chemicals. Most no-chemical cleaning systems work on cold water, eliminating the need and expense for hot water. Chemical left on surfaces can cause rapid re-soiling on floors, carpets, and other surfaces. This is eliminated with no-chemical cleaning systems. Ozone has been shown to oxidize germs faster and more effectively than chlorine bleach. *The ozone used in aqueous ozone cleaning is harmless and is the same as what is found naturally in the environment.